Well it finally time to make some much needed progress. Living over a week without a kitchen sink or dishwasher was awful! 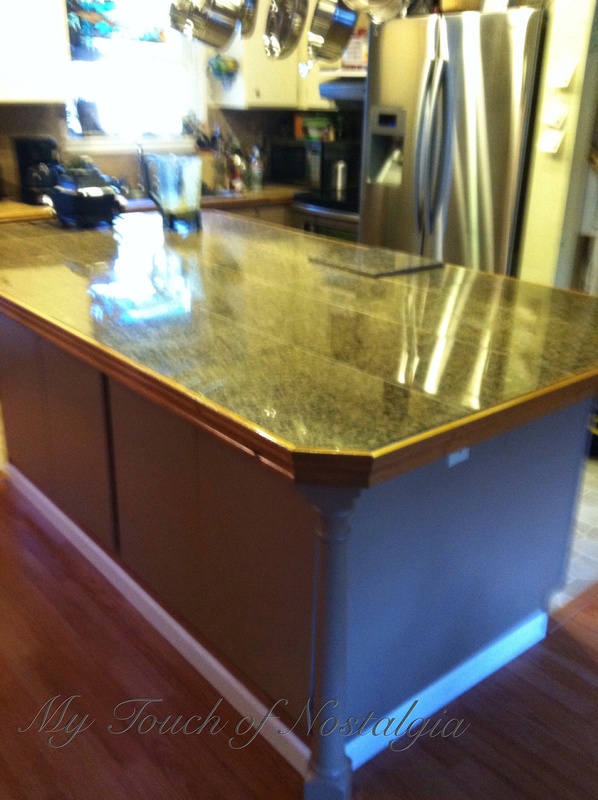 The plywood was put on top of the base cabinets by the cabinet maker. Then it was my turn to make magic happen. 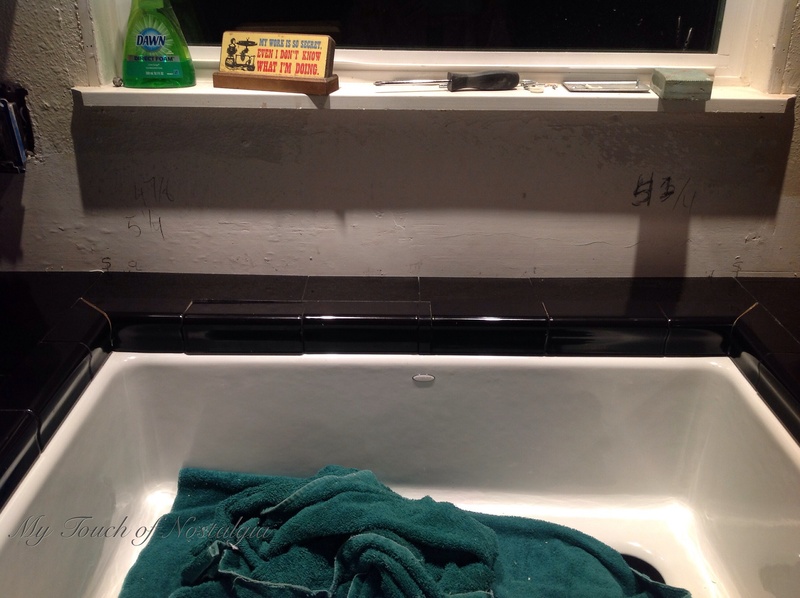 It was a hard choice, I knew it was white subway tile, with black counters. I went through all the options of Soap stone, but that bid was more than almost all the kitchen. 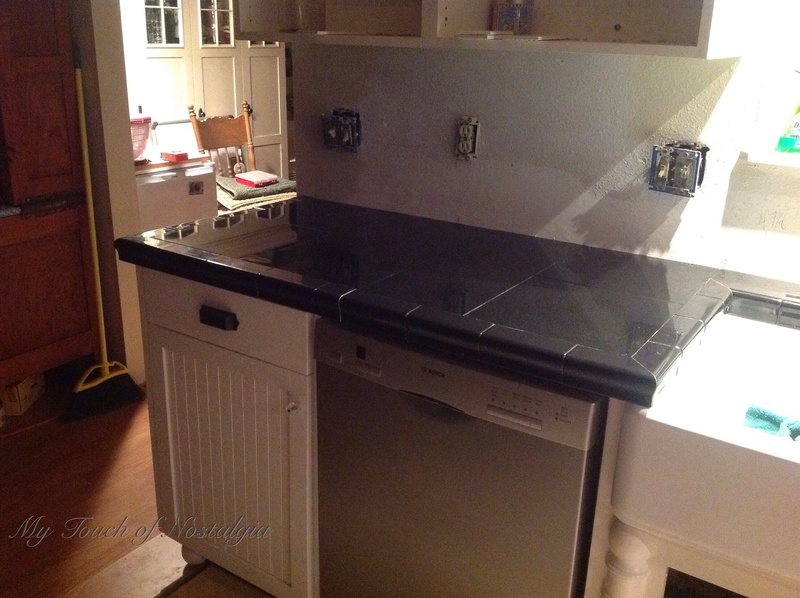 Then solid black honed granite, well that was pretty much over the budget too…..What’s a girl to do? Never fear and as a budget designer I knew I could find a solution. First my cabinet maker had an idea for an industrial grade Formica counter. He even ordered a sample and mocked up a sample. Of course for the life of me I can’t find the photo! It is a solid color thru product used in labs. It was matte black and if it chipped or got cut it was black completely inside so it would never show. Sounds appealing. 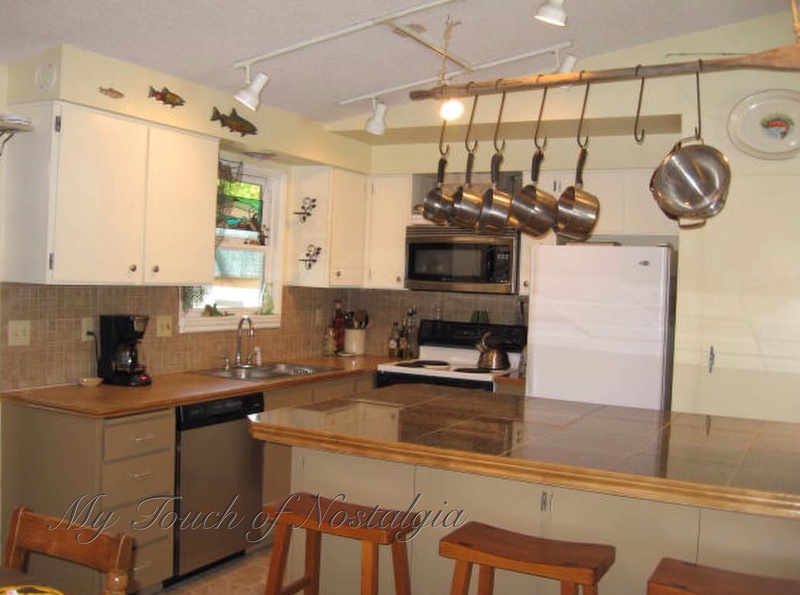 But not sure a big plus for a buyer who might not be as welcoming to a new custom kitchen with Formica counters. Along came granite tiles with a rounded edge already applied. These are called Lazy Granite and are 12×12 tiles and you could order any configuration to cover your countertop and it would have an edge already on it. However this kitchen has so many corners and edges that it made this product more expensive than it should have been. Seriously it shouldn’t be this hard! So with a little investigation and clever frugal mind I came up with a solution! Black granite tile with a black ceramic edge. Wait, give it a look before you judge it. 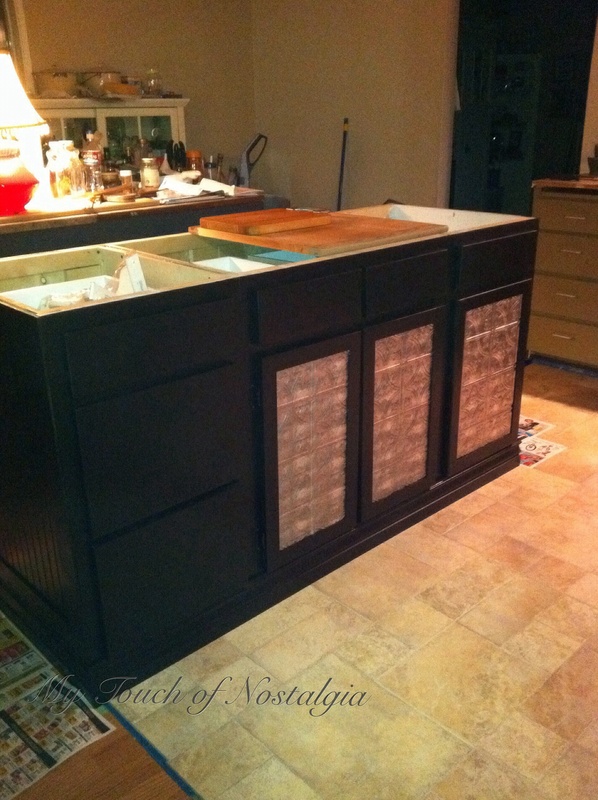 It was budget friendly, fit with the vintage look of the overall kitchen theme and was a DIY project I could do myself, which meant further savings. 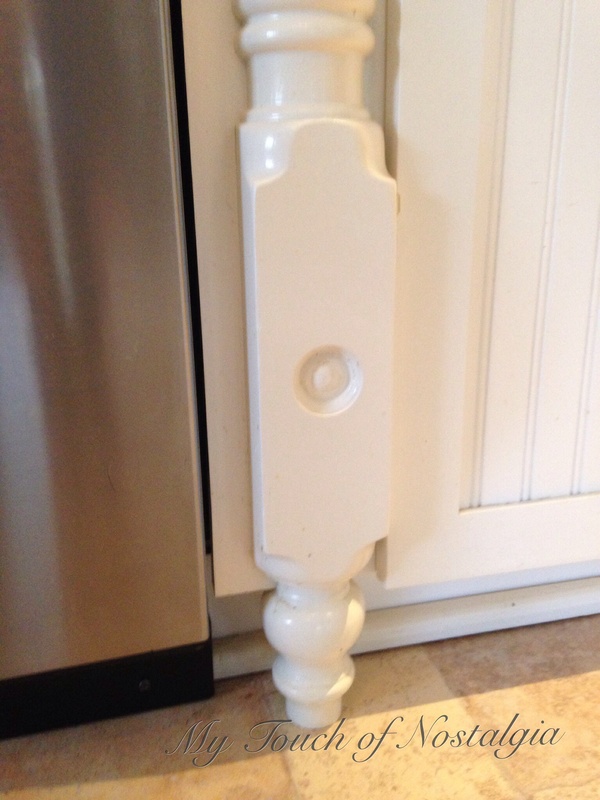 The ceramic edges were installed upside down, for lack of a better description. 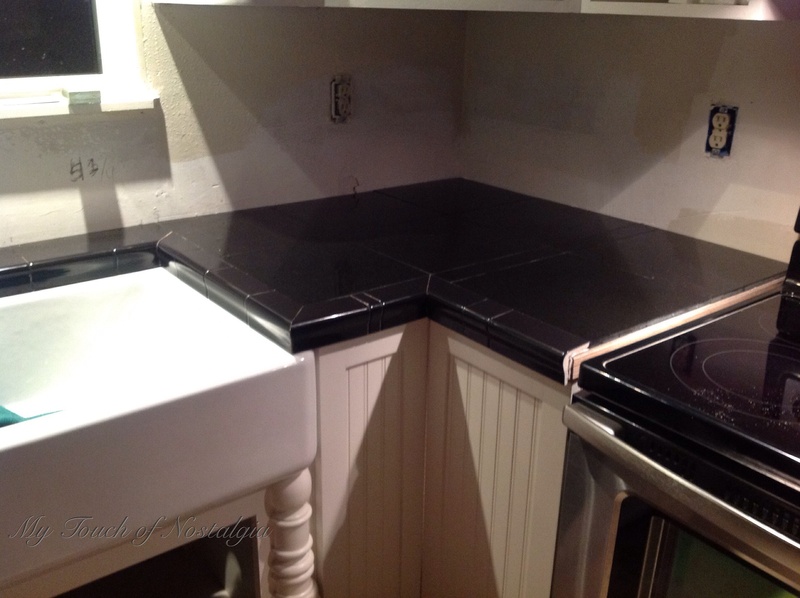 They went around the edges, with the granite as the filler. 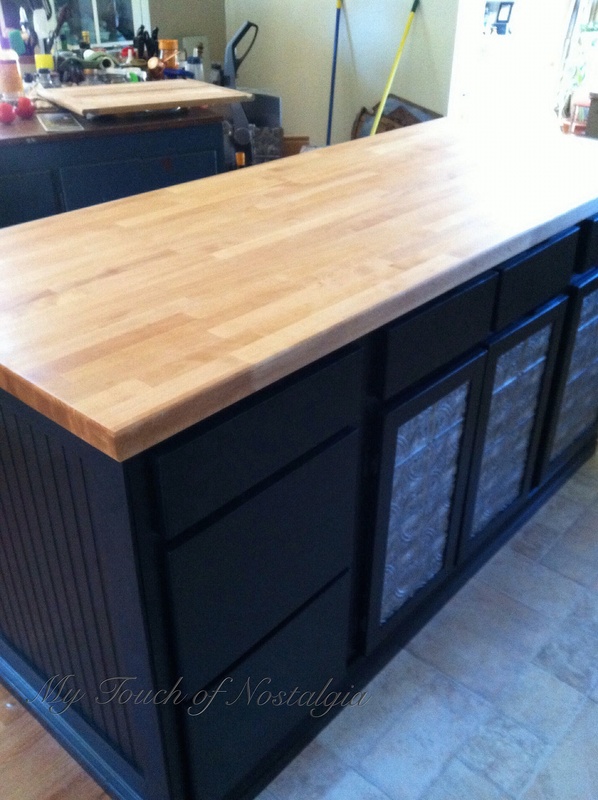 Black grout used to make a flawless finish and voila the perfect Vintage counter was born. 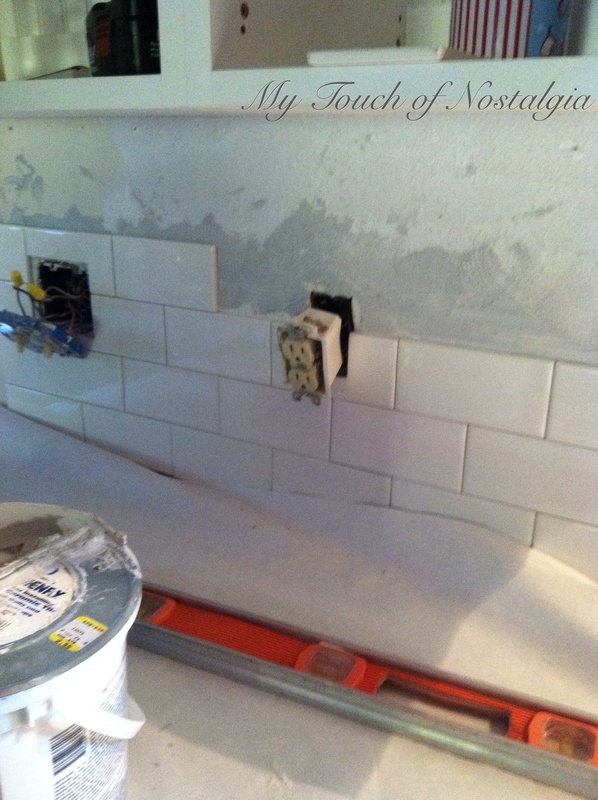 The backsplash was traditional white subway tile with a black accent line of vintage goodness. 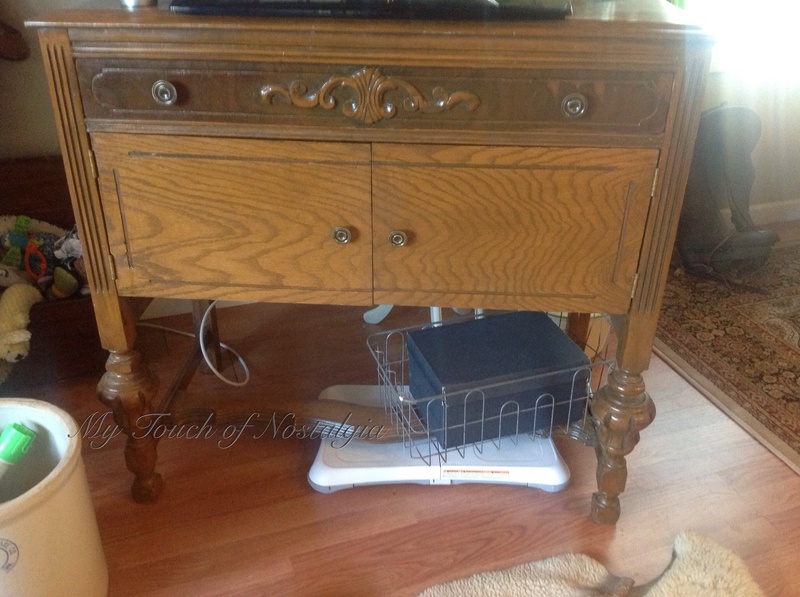 We we used the top of the bed posts as legs on the base cabinets. Also some quarter round. 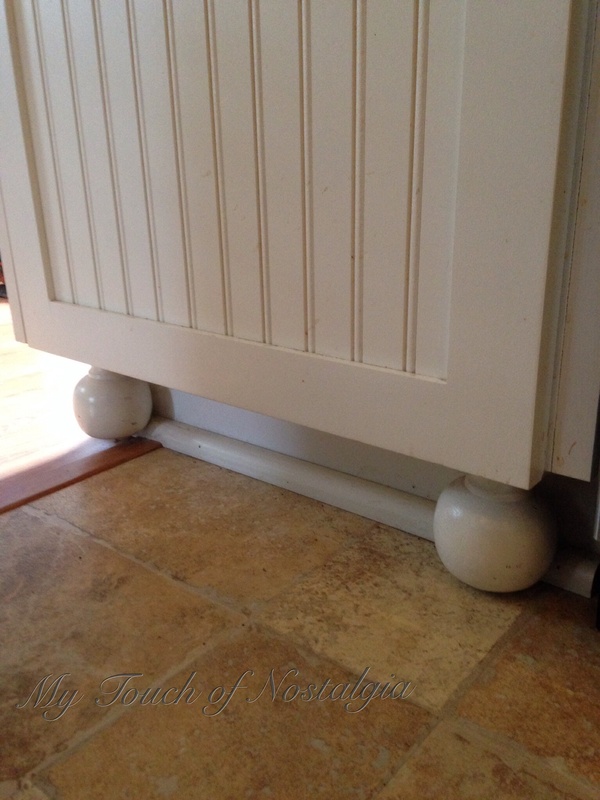 And you you remember the sink base legs from the footboard of the bed. It is so nice to have the cabinets in. Now for the uppers! So when I came up here to Portland for this design job I had a few other reasons to visit. 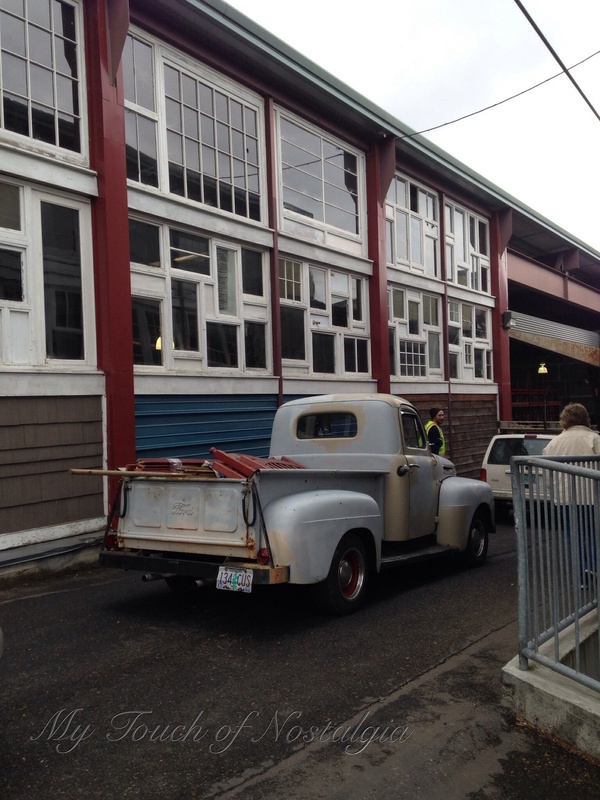 First of course was the bathroom design, also to see family and friends, do a little thrifting, and salvage. Pick up a gently used new to me car. 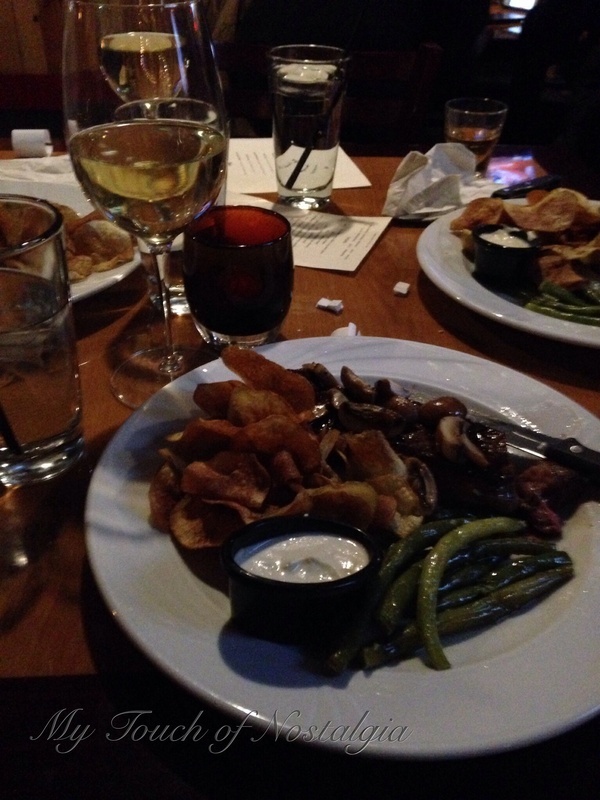 And to celebrate my Birthday. I’ve done a little of all those things, but would have done more if I hadn’t got caught in a snow and ice storm! So the bathroom design was a several day process working with the clients. A day with a good friend doing some salvage. I found some great pieces for a couple of projects. 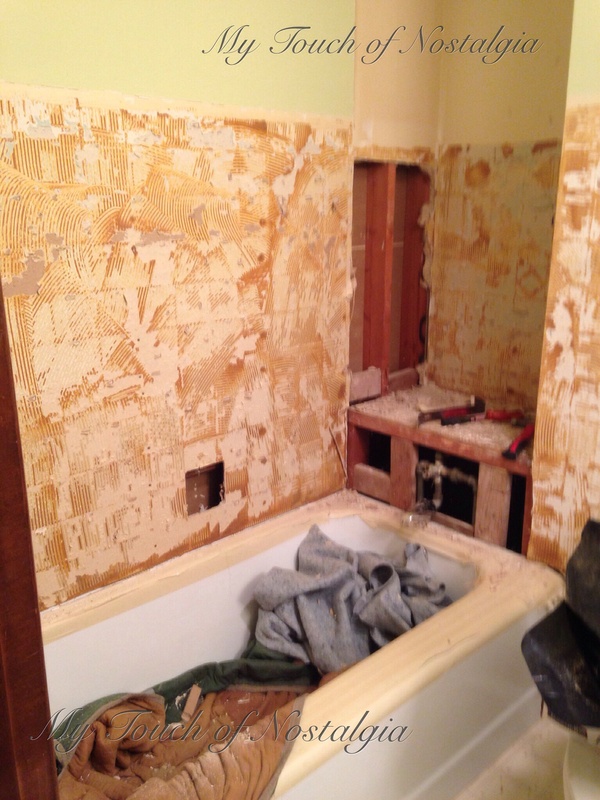 Made progress on the bathroom remodel. 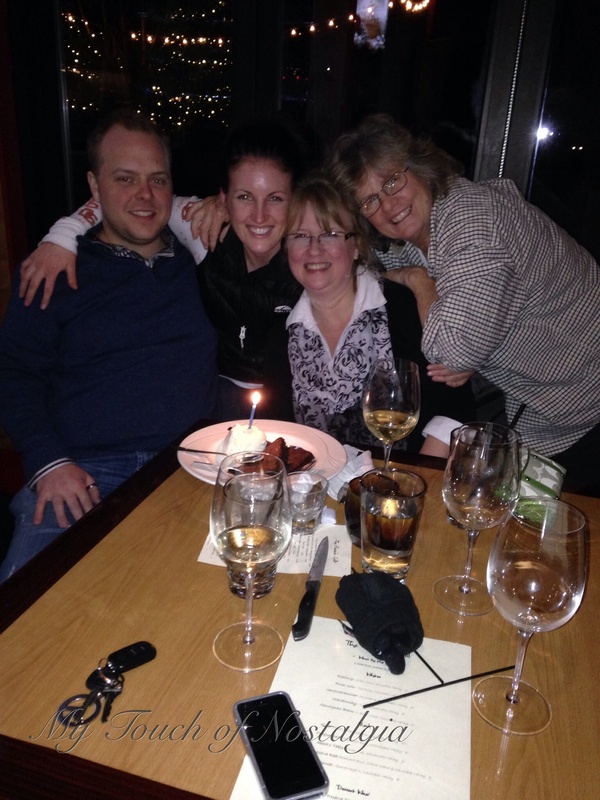 Had a wonderful Birthday dinner. Tried to get places during a terrible storm for supplies during some crazy weather! 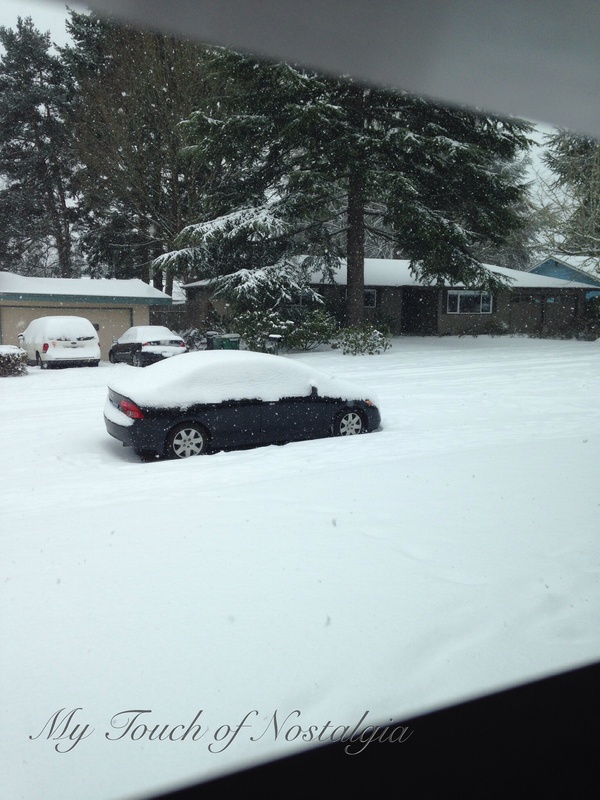 Unable to drive due the weather. 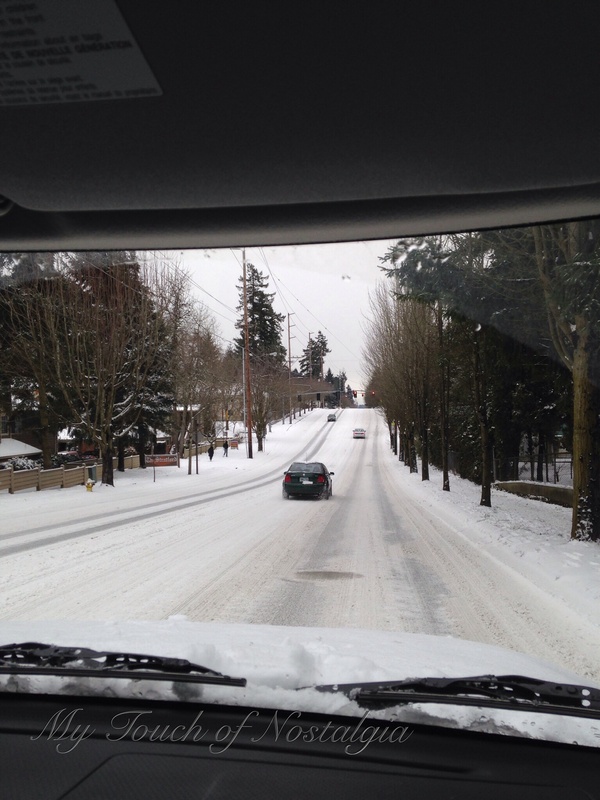 Have to depend on a SUV ride. But enjoying the peaceful snowfall and beauty too. 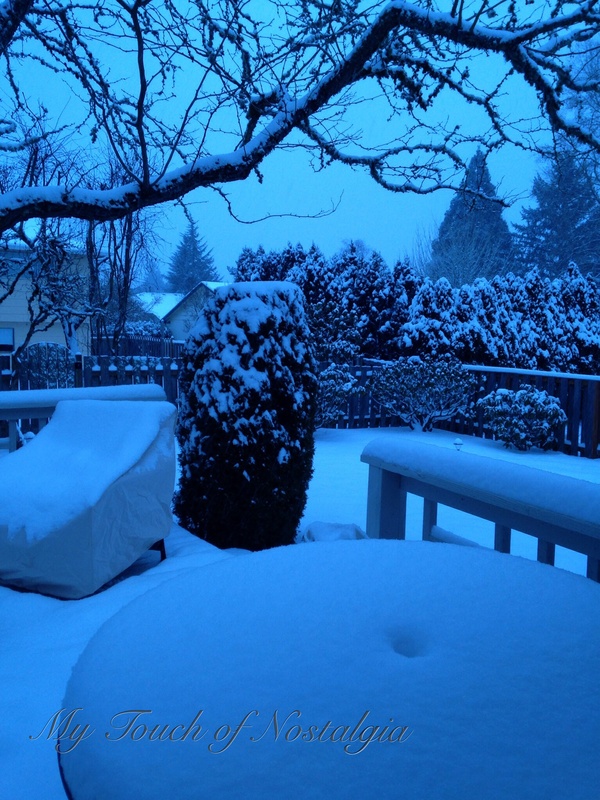 So wonderful at dusk the sight of the new fallen snow. However I’m ready for our rain to return. And to be able to drive again! So we started the island if you remember from this post here. 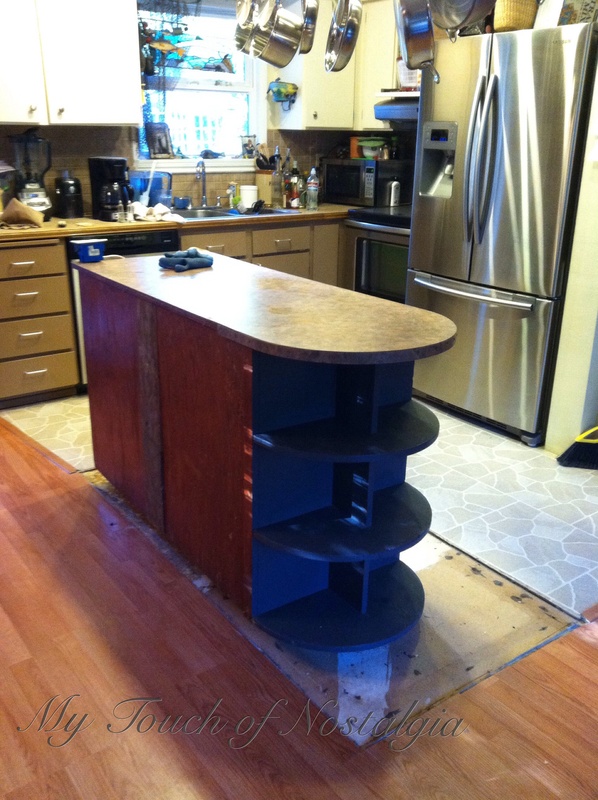 So now that the floor is done on the part where the new island will be we can install and finish it. It looked like this as we placed it in the house. Ran the wire up into it and secured it in place. Then connect it all together and put on the backing bead board. You can see it doesn’t line up with the green tape on the floor. The front has a toe kick that needs to be brought out to make it a solid piece. 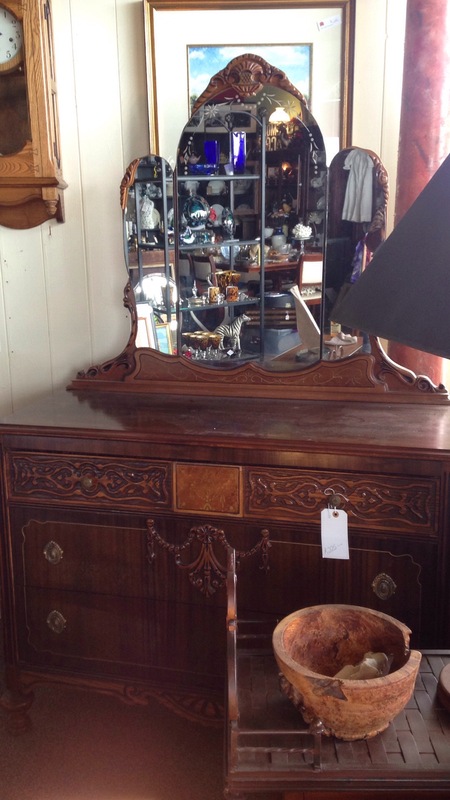 This will give it the illusion of a piece of furniture, or in this case the old general store counter appearance we are looking for. 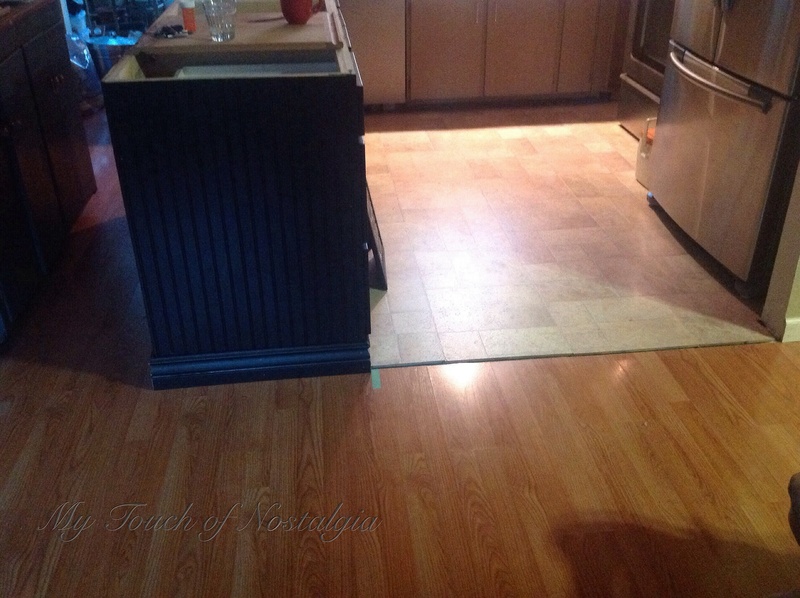 This was achieved by using 2×4 spacer pieces and one long 2×4 the length of the counter. The trim will hide all of this work. Here you can see the trim along the floor. I pre-painted it so it will just need to be touched up once it was nailed into place. 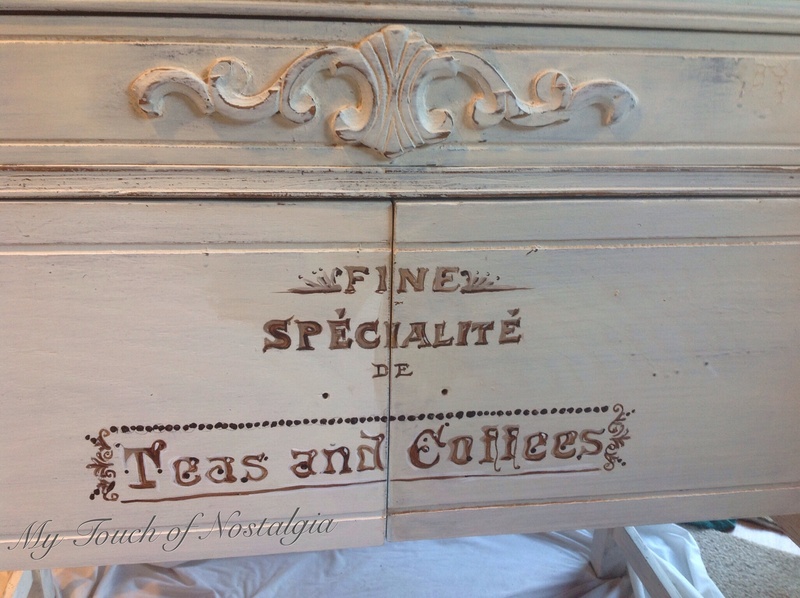 You can see the poplar strips added to give it the antique look. This is the other end with the opening for the built in microwave. you can see the wires there for the dedicated line for it. The microwave was suppose to be on a special shelf between the range and fridge, but due to having to allow extra space for the custom corner cabinet we lost space and had to move it. I’m not a big fan on them on the counter. This made sense and would allow a opening for it. I wanted the doors to be different on this piece than the bead board doors I selected on the cabinets. 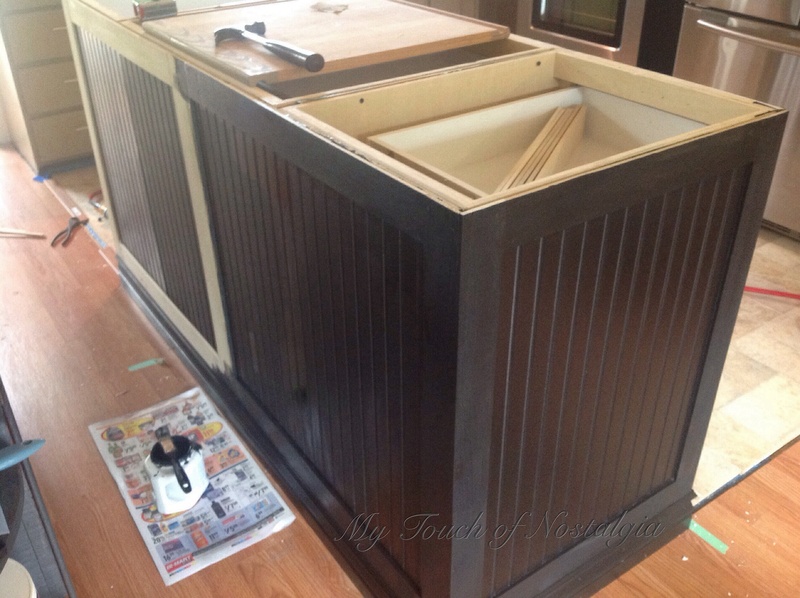 The pieces had a raised Shaker style doors, so I had a recessed area to work with. I got the brilliant idea to use old ceiling tin on them. I looked and found some online, but they were what I thought pretty expensive. So I figured why not use the fake plastic stuff. A trip to Home Depot, provided me with just what I was looking for. 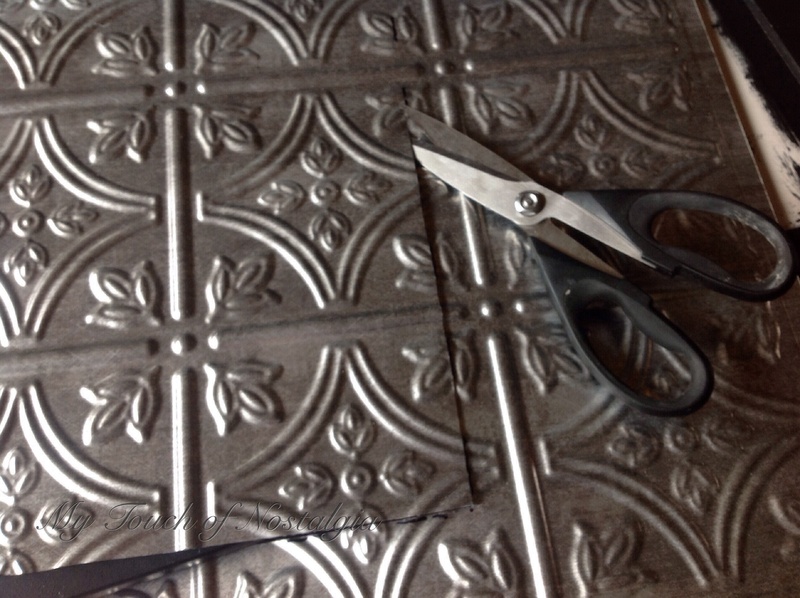 It is PVC and looks like tin ceiling tile, but is made to be used as back splash and has grooves to overlap and pieces to finish off the edges. 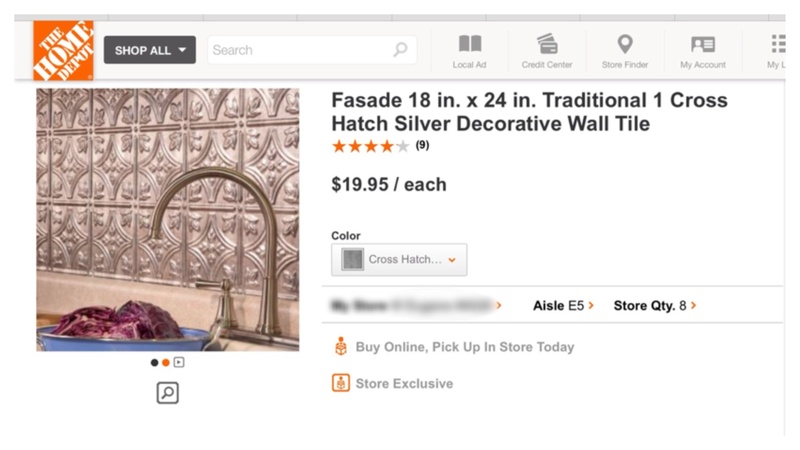 You can order online if they don’t have the color you want in stock and delivered to your local store. It will be in the kitchen decor/remodel department. I wanted my doors to match pattern wise so had to use a full sheet for each of the 3 door on the island. 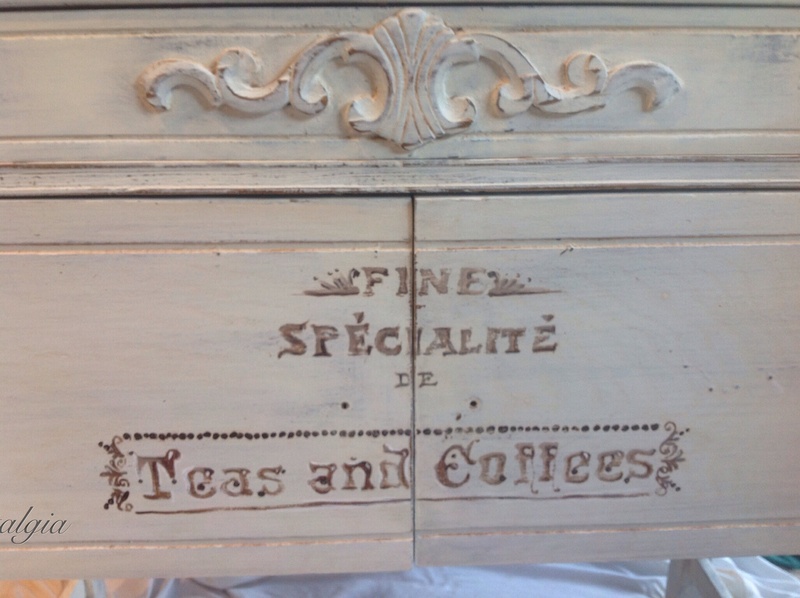 It seems a little expensive, but not when compared to original antique pieces if you can find them to fit your cabinets. I think they could be primed and painted too? I measure the door inserts and marked the panels. I then simply cut them with my kitchen scissors. They fit tightly into the insert area. I used liquid nails and put 5 dots on the door area, staying away from the immediate edge so it wouldn’t squeeze out the sides and show. I then pressed the PVC Tin Tile piece into the area and rubbed well. I let lay flat for a day and dry. I attached the new hinges and hung them. I had selected the hardware for the new cabinets and couldn’t find anything I liked better so did use the same hardware on the island. 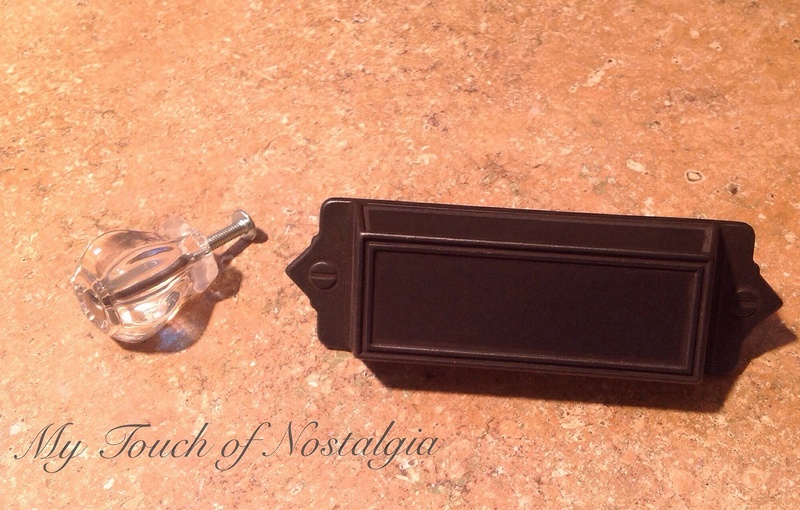 30mm Victorian Glass Knob, and Martha Stewart 3″ Bracket Bin Pull in Iron. The glass knobs are just under $3.99 each. I did get the iron bin pulls for $1.98, they sell now for $4.97. 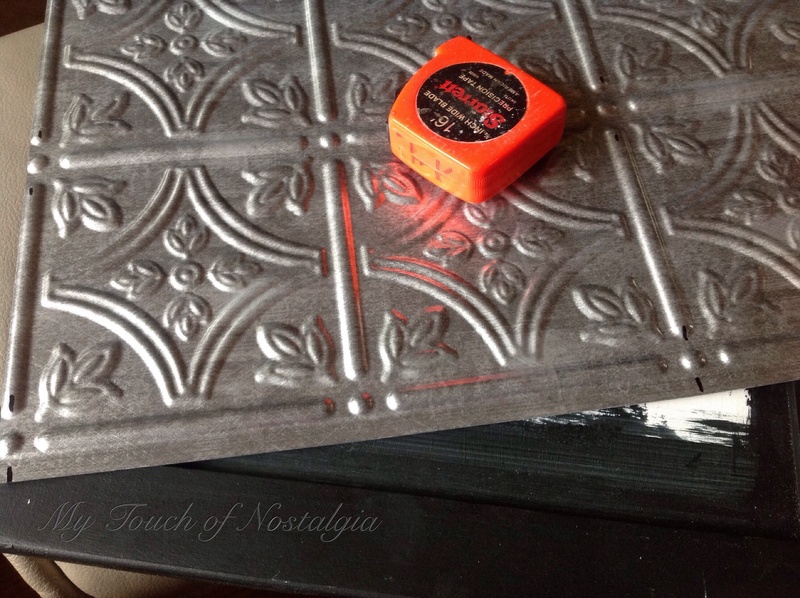 They didn’t show very well on the black painted island so I took a silver paint pen and rubbed it on them, quickly followed by rubbing with a rag to spread it and get it into grooves. The top is going to be butcher block. I found one at IKEA that is perfect. 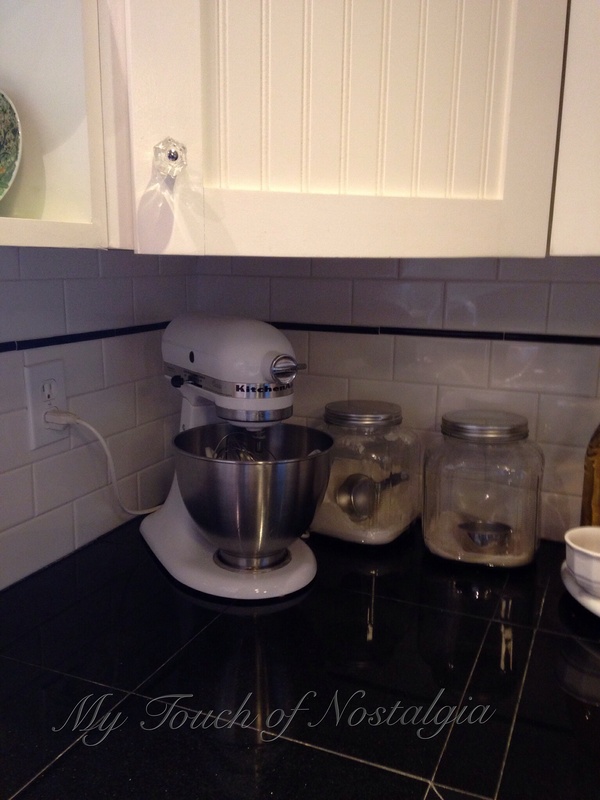 They sell counters that are a narrower width, but also a piece that is a wider width. Problem is the nearest IKEA is about 3 1/2 hours from us so we need to wait until someone is going that direction that can haul it! So until that happened we made do. This is before the hardware and distressing. I sanded, then stained, and waxed to give it and old used feel. 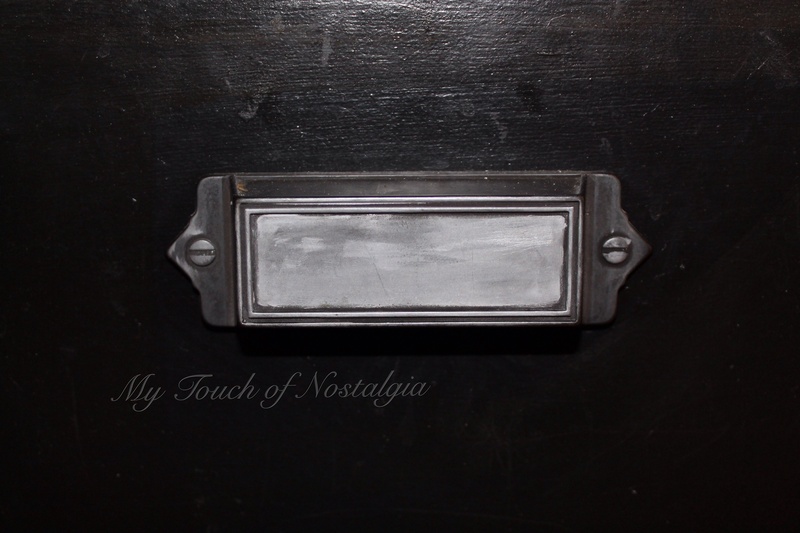 If I would have know about milk paint then, it would of been milk painted with some chipping goodness! 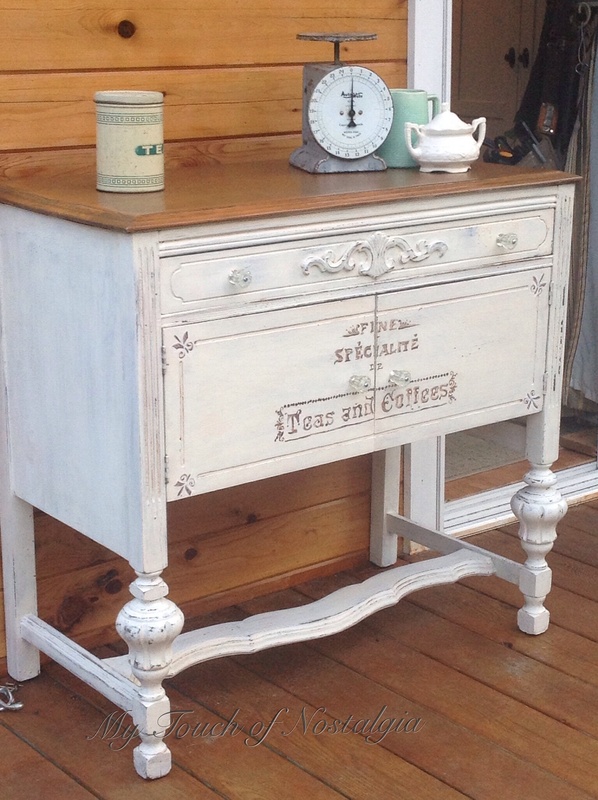 However it turned out good, and even people who love antiques think I “found” my old store counter and converted it! We finally got the top, the cabinet maker cut it down to fit. It was wired with an outlet at both ends and one inside on a separate circuit for the microwave. I tested several stains and found one that matched the Red Oak that is on the floor on 2 sides of it. And used a natural Bees Wax to seal it. 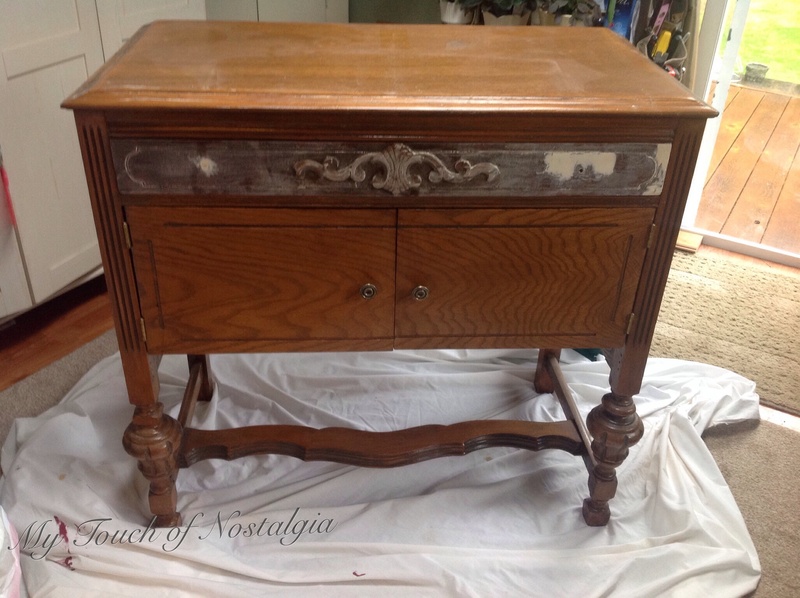 It gets a good cleaning sanding and re-waxing about every 6 months. While on my trip to see my son, (here) I purchased a few things at IKEA. I installed them on the island to give it more of that general store look and also some practical storage solutions too. And a view of the microwave end too. Here you can see the distressing also. Just were it would be worn perhaps from customers rubbing against it while talking to the shop owner, or from being moved or cleaned over the years. I love it. It is functional and looks great too. Plus I like the fact I can say “yeah I built it” ( insert big smile). 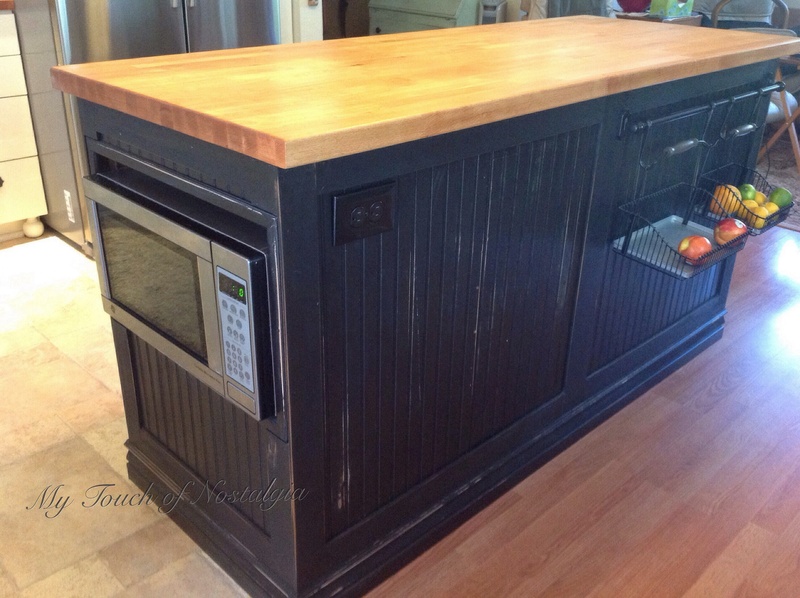 So more to come, the lower cabinets are next, and another great repurpose project too. So because we are living in this mess at the same time as remodeling it is a challenge to say the least. Almost all the old is torn out now and the wall repaired and ready to paint. 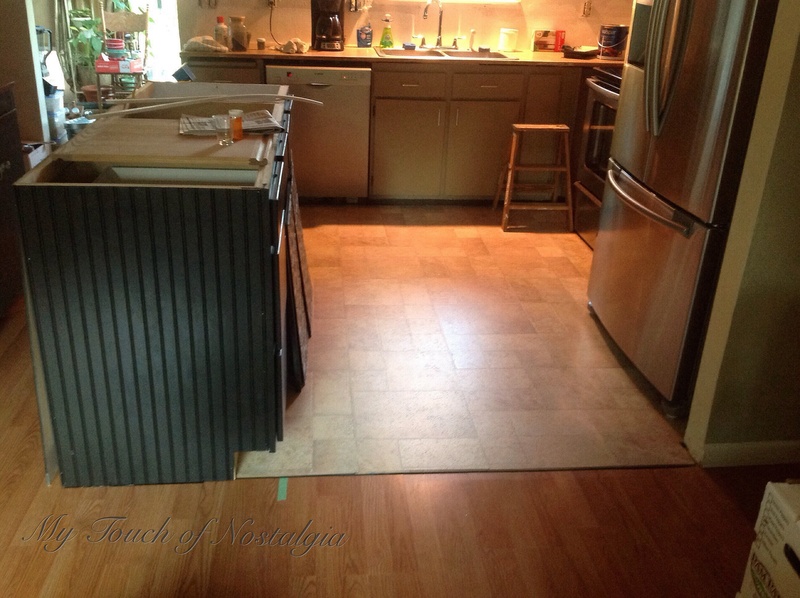 “We” are laying the floor before we tear the last part of the cabinets containing the existing sink. First the “We” is me. Me and me alone. And second I know it seems odd to lay the new floor with part of the old cabinets still in use, but it will all work out. 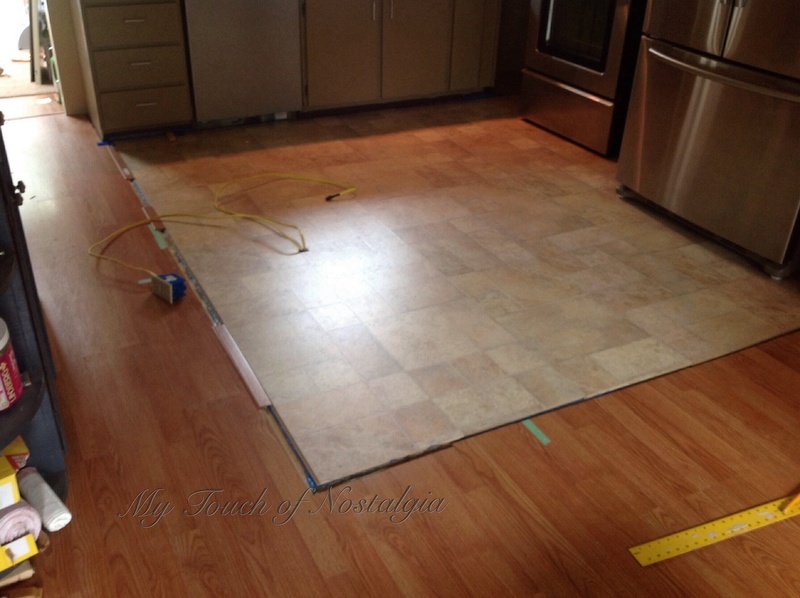 The part where the new floor isn’t being laid is under the cabinets so will never be seen. Using plywood to level it out, after the tear out will be cheaper in the long run. As you remember we have that 1970’s vinyl as our base. Oh gee how could you forget. Starting with the underlayment it was rolled out and joined as was directed on the package. It covered the open area when the floor was to be laid. I have installed a good many laminate and snap together floors so figure this small area with these large pieces will not take very long to install, so I’m anxious to get started and finished this morning. The green tape marks the island placement. The power supply is the wires coming out of the floor that will come up into the new island to power the outlets and the microwave outlet. You can see a piece of the flooring on the left hand side of the photo. And this corner is where we will be laying the first piece to start the pattern off with. I opened all the boxes and there was 3 different patterns included. However one of the patterns I had a lot of, and one of them only 3 pieces. This made me wonder how this was going to work? The first piece was laid and the end piece running into the old cabinet was cut and attached to the first long piece. 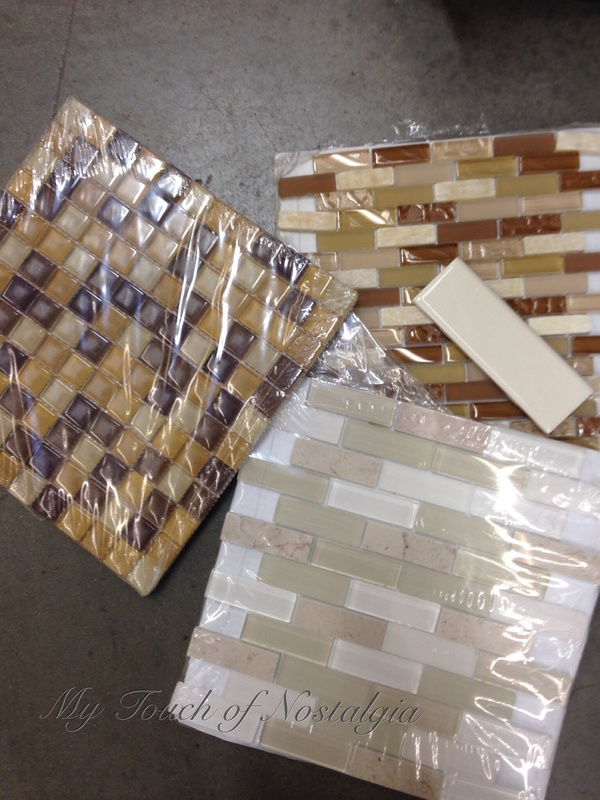 As I laid out the next row to match the pieces or their grout lines, I ran into a problem. This wasn’t going to be easy at ALL! Once I found suitable pieces I just laid them there without attaching them and looked for the next row. This took the better part of the morning just trying to match the grout lines! I was in over my head! Well I thanked him and promised him home baked cookies, for his advise. And after he left I looked at the floor and calmly told it, “You will not beat me, I will win!” I took a little break then started back matching this odd pattern and putting it together. 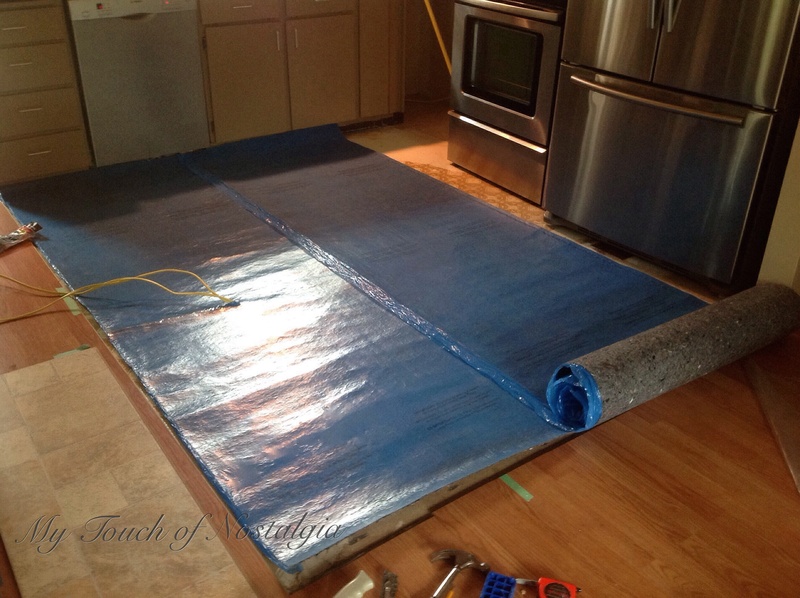 once I got to the stove and fridge I slid them onto the new floor, laid the pad and continued to the back wall. I might add this floor didn’t want to stay together either, so it was an uphill battle the whole floor! Finally by 5:00 I had finished the last pieces, then pushed the appliances back to the wall. It looks perfect, is a breeze to clean, doesn’t really show when it is dirty. 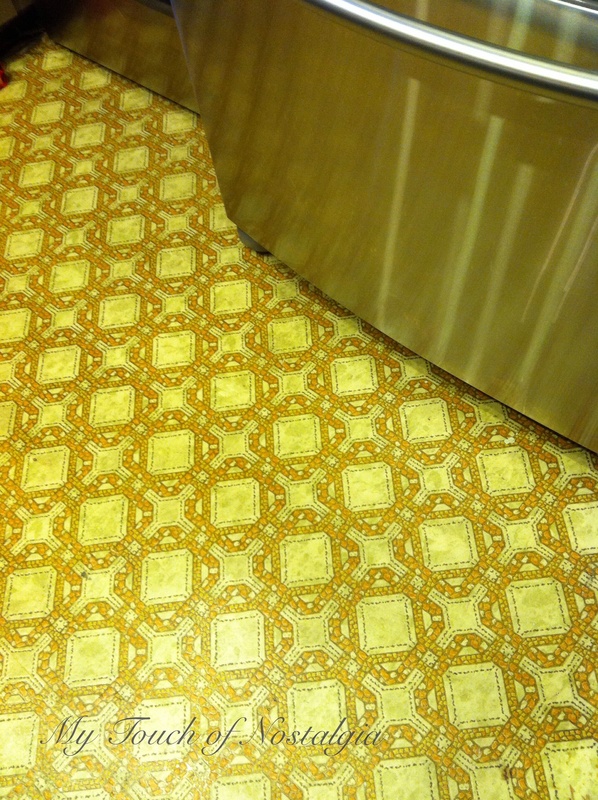 But I would never have this floor again! The corner are very brittle and seem to break easy, it was awful to install. Now that that is complete we can move on! So it all started with this little buffet. Sorry about this terrible photo, I can’t find the better “before” one I know I took! Isn’t that how it always goes? I have drug this thing around with me for years. It belongs to my mom. It wasn’t that special to her. She purchased it long after I moved out and had my children. It was refinished and really nothing special. It was however small and the perfect size to put just about anywhere. I even tried to sell it a couple of times over the years I’ve had it, but it never sold and I kept it. She had her issues many I didn’t realize until I finally decided to give her an update. I wanted to try Milk Paint on her. I ordered Light Cream and some Bonding agent. I got distracted, and finally found time to start her. First I sanded her lightly, nothing dramatic. I filled in a couple of spots that were lacking veneer. As I began working on her I noticed this wasn’t her first face lift. She has had a rough go around before. Her sides have been replaced. Her top has been peeled of old veneer and salvaged what was left. Her bottom lifted, and her door cut off and rehung. She is missing parts of her legs, and I found some interesting holes in her. I had a plan, she was going to get a nice smooth coat of paint with some slight distressing on the edges. She would keep her salvaged top for now, and some new hardware. Well I think she wasn’t happy about another facelift. Mixing the paint, bonding and getting it on her was the first part. Then sand and another coat, then another…..she did do a little crack and peel. Some area required more coats than others. It was not the paint, it was HER. She had so many different parts, with what I now know where different finishes. She distressed on her legs more than anywhere else. And her doors showed their remodel as a light color. She was sort of “Frankenstein”. All in all, she chose what she wanted. When I do my “ugly chairs” I let them tell me what they want. So I finally started to listen to this little girl. Her doors would have some kind of graphics on them. And since she wanted to be chippy, and rough we would let her age show proudly. I searched through “The Graphics Fairy” but couldn’t find anything I really thought was her. I did find some words I liked, so decided to would free hand some words on her doors. Went with the Tea and Coffee theme. 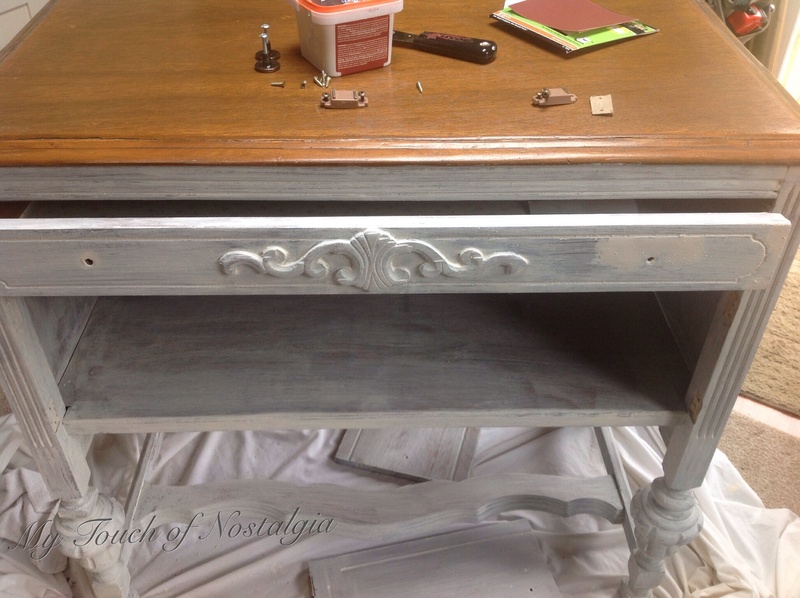 Painted it by hand so it is old and primitive, then sanded it and aged it with a mix of 2 colors of stain and wax. (Here I’ve applied the stain wax mixture to the drawer and the left hand door). Then I sanded her real good before adding, more coats of the wax. I let the wax settle into her crack and holes. 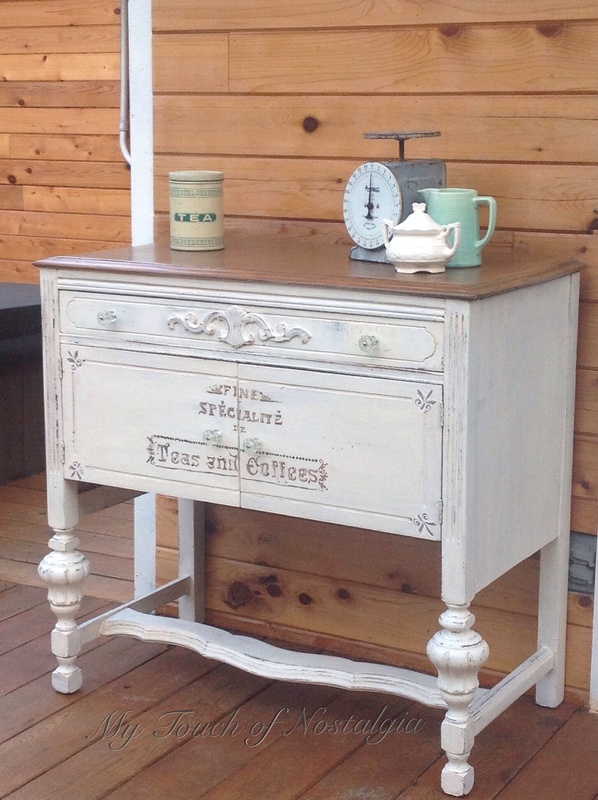 Like maybe she was a coffee server at one time and is stained from the years of grounds and drips. I found some old clear glass knobs in my box of hardware I keep, so those went on her. 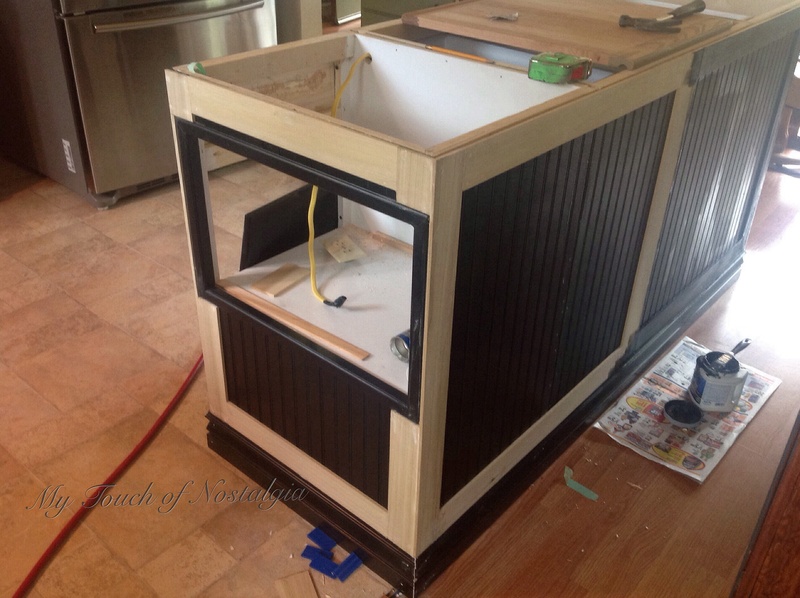 She now looks like she is ready for service as a Coffee Bar. She has plenty of storage for everything you might need. She isn’t perfect. And this one lives with me. So when I decided to remodel the kitchen, it came about in an odd way. It all happened really by accident, that’s my story and I’m sticking to it! 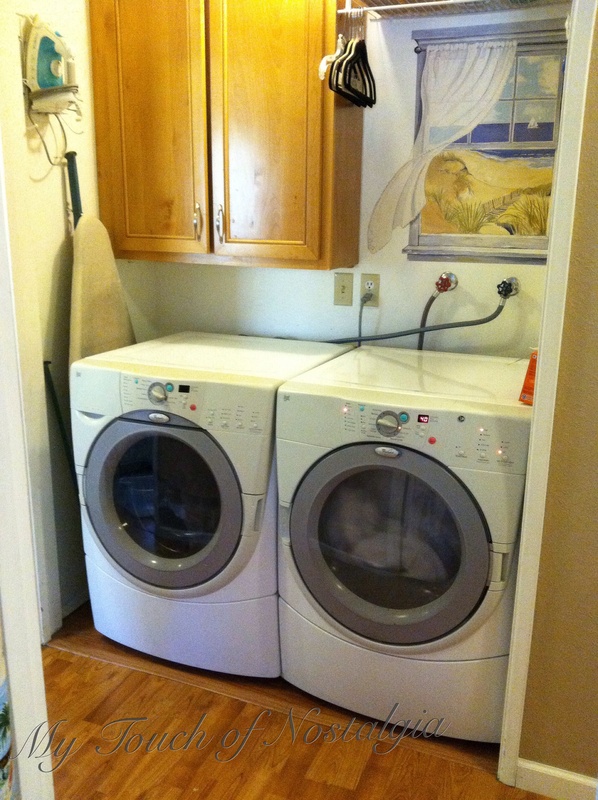 It all started with a new washer and dryer. I told Mr nostalgia I thought it was time to update our set of front loaders. We had had them for a while and used them a lot. 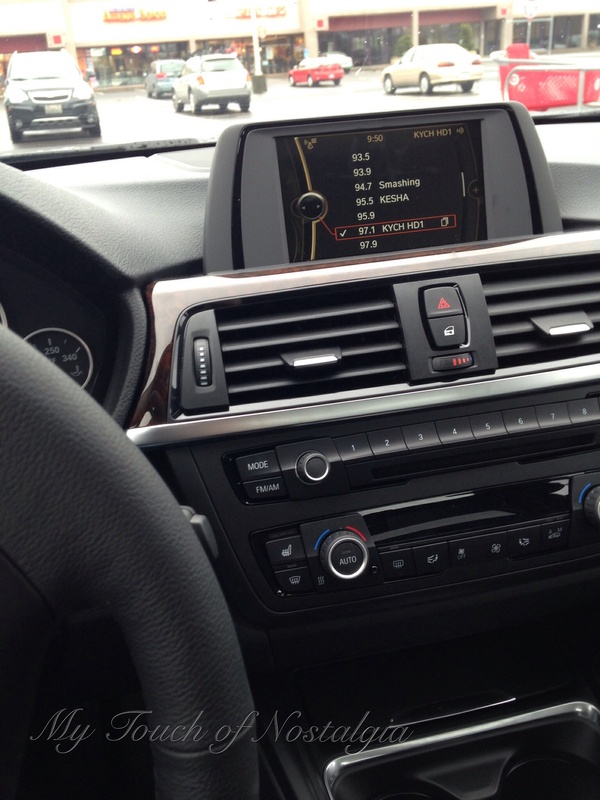 I just figured it was better to upgrade before we had to. This is the old set, there is a funny story how we sold them on Craigslist! That will be a later post. While in Lowes one day I checked out the current brand and models we all ready owed. Check! They look good to me, I would love to venture out and do a color but, white is fine and goes with everything and blends well. Oh yeah we will go will the pedestals too. Well a few months before Mr. 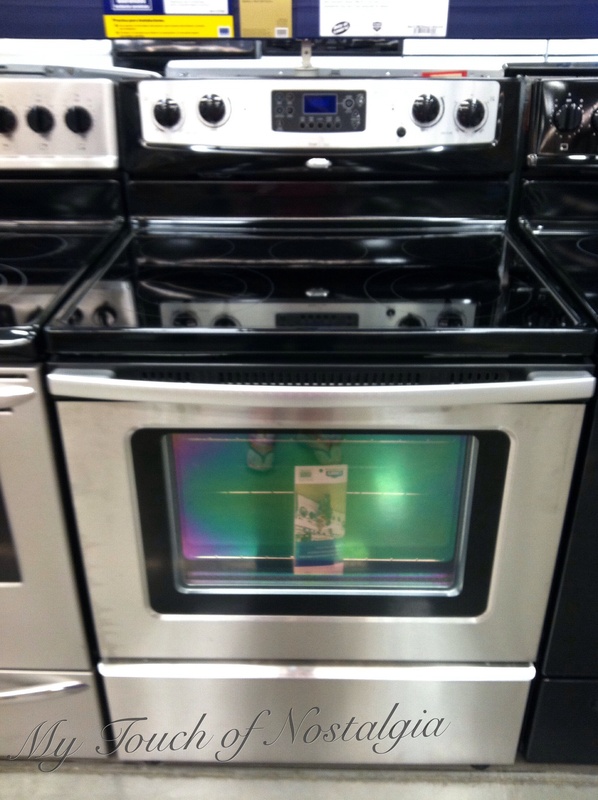 Nostalgia and I had been in Lowes to pick out items for his business remodel and bought ourselves a new microwave. 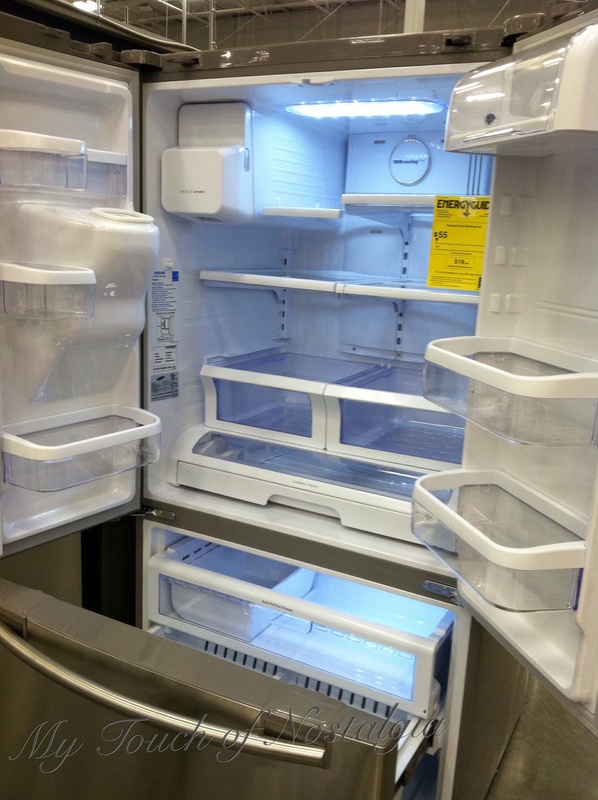 We looked at new refrigerators and of course men being men he picked out the biggest and best that he liked! We didn’t buy one just cruised. 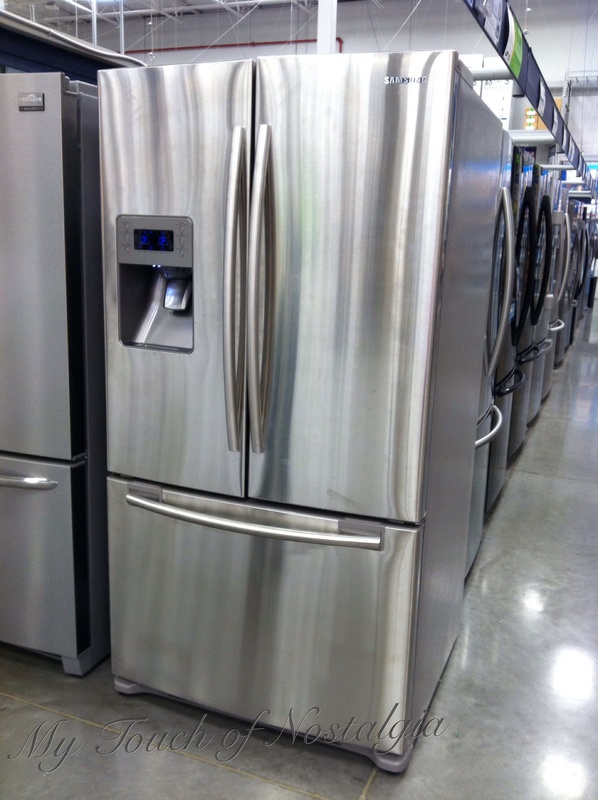 So while I’m there looking at washer’s and dryers, I check out refrigerators, and ranges. The wonderful sales associate answers all my questions while I took photos on my phone to share with Mr. Nostalgia. The sales associate informs me that they will be have a sales event coming up and all the details, writes up my selections and I’m on my way. Of course when I show Mr. Nostalgia his refrigerator photos well that the one he has to have. 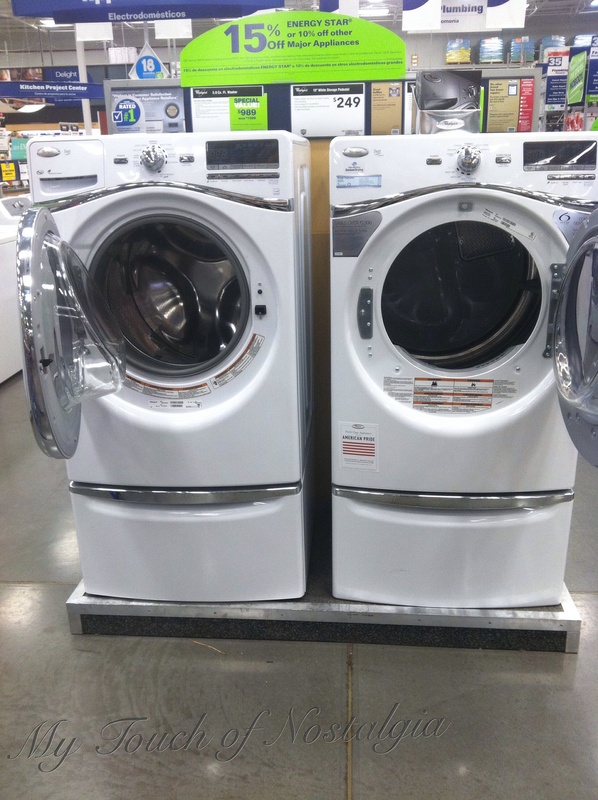 So on the sales weekend I head to Lowes to purchase my new appliances, Washer, Dryer, range and the refrigerator. They are all set and delivery is set up. Here it comes…..the refridgerator is to wide and to tall for the opening. 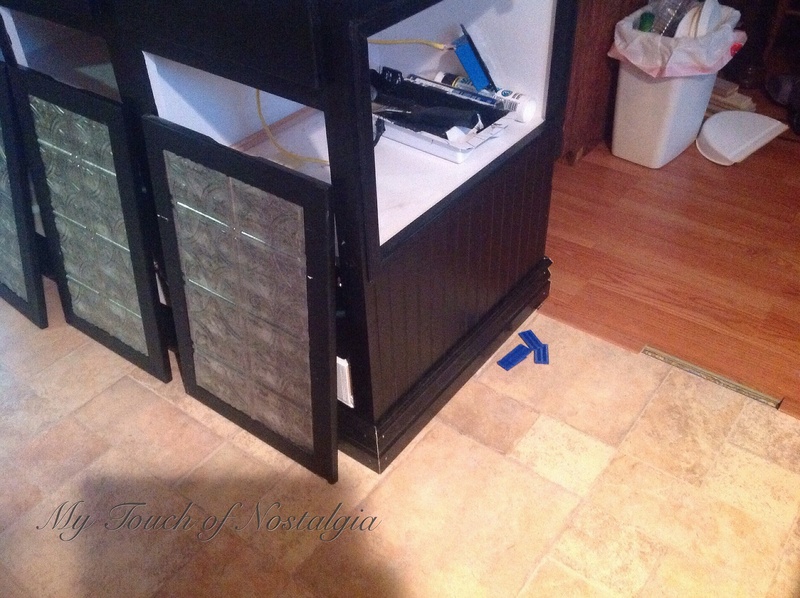 So I tear out the cabinet above the old one, and the little cabinet next to the stove. Now we will have to do some work, but not to bad. I have to take a lunch from work to come home while they install the new washer and dryer, range, and refrigerator. 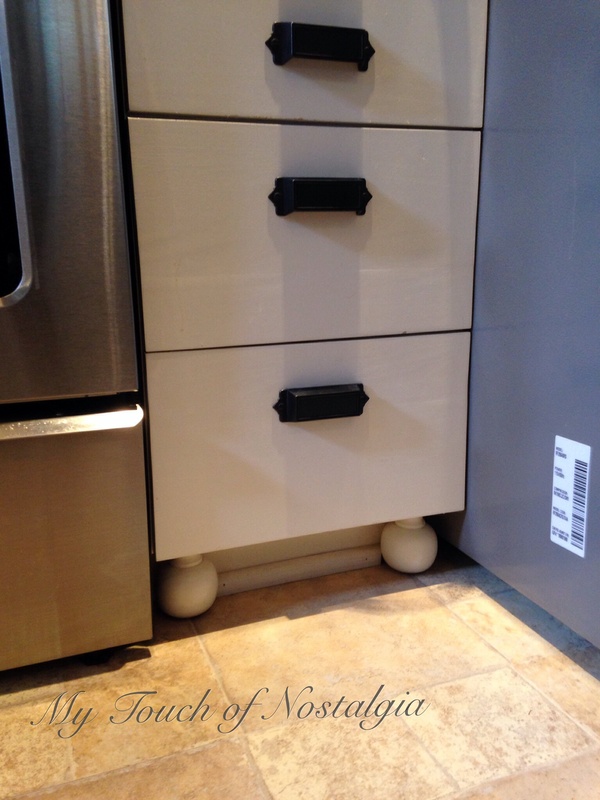 Everything goes pretty smooth until the refrigerator.It won’t fit between the pantry door and the kitchen island. They have to remove the French doors and bottom freezer drawer. Thankfully it fit! 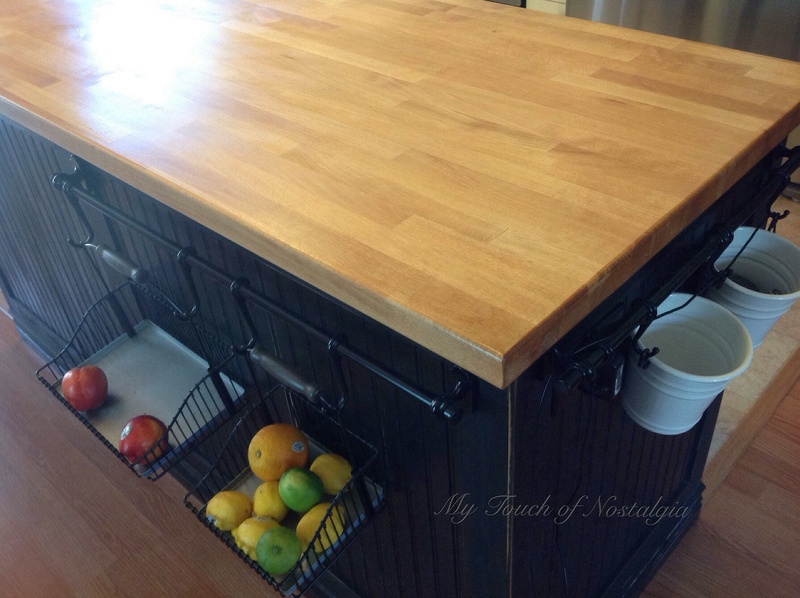 However you cannot really open the doors and work in the kitchen. Sorry about this blurry photo, only one I could find of the enormous island! So the remedy was to hire help and we tore out the island. We hauled in an old cabinet from the garage to sub in while we figured out what to do with the kitchen.